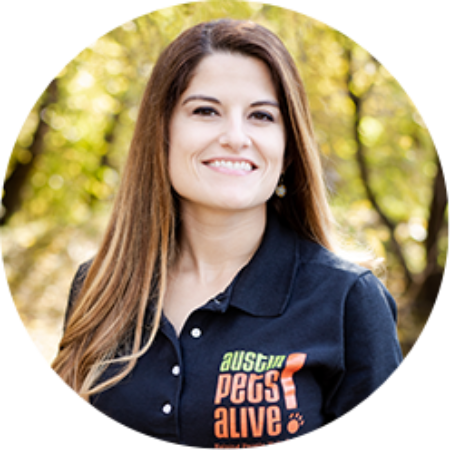 Sabrina Wells has been APA!’s Director of Finance since 2016 and now also serves as the Director of Finance for American Pets Alive!. As the Director of Finance, she oversees all aspects of the finance, accounting, human resources, and general administrative operations. She provides leadership, financial acumen, and strategic insight to ensure the financial health, integrity, and growth of the organization. Sabrina graduated with a Bachelors and Masters in Accounting from the University of Texas at Arlington in 2004 and 2007, respectively, and earned a Certified Public Accountant (CPA) license from the state of Texas in 2009. Her experience includes five years of public accounting experience, where she audited companies in various industries, including nonprofits and foundations. She has also served four years as a Controller for a for-profit company before coming to APA!.